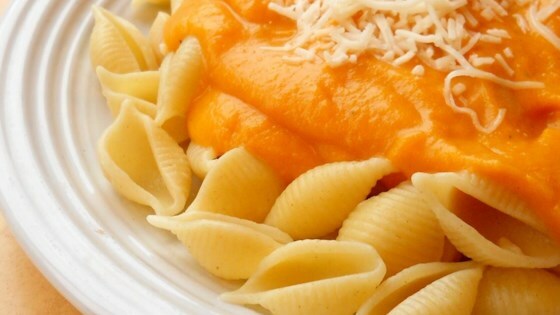 "I had some leftover cooked butternut squash and and made this savory pasta sauce. It is tasty over ravioli or any whole grain pasta. Your squash should be very soft to begin with. I generally steam my squash in a slow cooker for 4-5 hours." Place the squash into a saucepan, cover with water, and bring to a boil. Simmer the squash until very tender, 15 to 20 minutes. Drain excess water. Cooked squash should equal 2 cups. Heat olive oil and butter in a skillet over medium-low heat, and cook the onion, garlic, and apple, stirring frequently, until softened and brown, about 15 minutes. Add butternut squash and chicken broth, and bring to a boil over medium heat. Reduce heat just to a simmer, and stir in the milk and cheese blend. Stir until the cheese has melted and the sauce has reached desired thickness, 5 to 10 minutes. Season to taste with salt and black pepper.